You are probably reading this post on your laptop or cell phone. Or maybe Alexa is reading it out loud to you! Electric devices are so essential to every aspect of our life that it is difficult to go on with our daily tasks even for a few minutes without electricity. In your spare time, Alexa might read to you a dystopian novel where society disintegrates and chaotic conflict erupts in a developed country. You might then discuss the novel’s take-aways in your book club with a calm voice knowing that in reality you will not have to try to survive such a situation yourself. In parts of Sub-Saharan Africa, though, many people struggle in such circumstances. Approximately 600 million people there can tell you what life without electricity is like. Worse, civil conflict is not just a subject of dystopian novels for them. Many men and women there have experienced conflict in their lifetime, and the possibility of additional conflict is very real. The crying need for electricity and the threat conflict poses to the integrity of power systems must both be dealt with by engineers like ourselves who are trying to design power systems that will meet people’s needs. We were amazed to learn, though, that planners and policymakers use the same computer tools to plan investments in Sub-Saharan Africa as in developed countries, despite the very different needs and stresses they face! These tools were originally developed for use in peaceful, advanced economies, and miss many of the crucial risks and objectives faced by planners elsewhere. This surprising observation motivated us to investigate how conflict risk could be considered by models for evaluating power system investments. Happily, we were not the first who have studied power systems in conflict conditions, and so we could benefit from others’ experiences. However, our review of power system damage assessments and press reports of conflict’s effects revealed a more complex story than previous research has recognized. For example, past research penalized large projects because of potential sabotage and therefore suggested investments in small diesel generators. Sadly, though, it is not only large projects that are vulnerable to disruption. Focusing narrowly on just one way in which conflict can affect power supply can lead to systems that are still highly vulnerable. For instance, past research ignored fuel shortages that can occur during conflict and would render diesel generators useless. 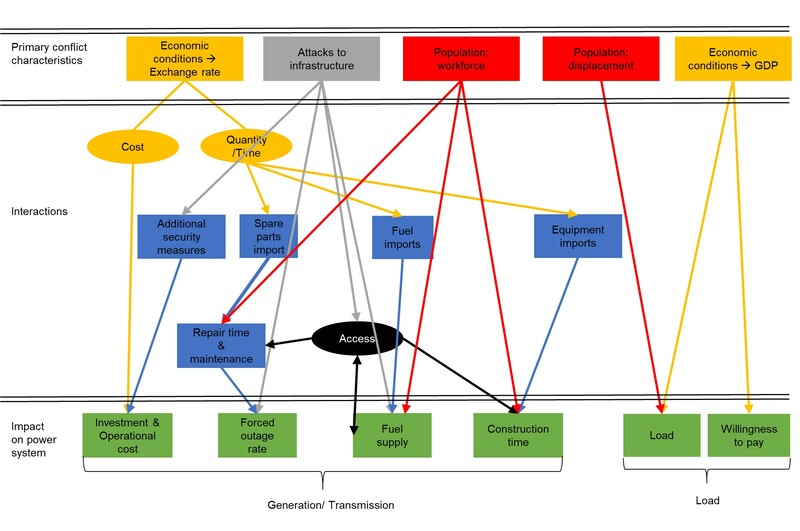 Conflict affects power systems in so many ways, as we indicate in the figure below, that all technologies are vulnerable to conflict to various extents, and there are no obvious “right” plans! What mix of technologies would minimize vulnerability of a power system in a particular country depends on many factors. During our review, we were also surprised to find out that past models assumed that periods of peace or conflict would last for decades. This assumption is either overly optimistic or overly pessimistic! Instead, we employed probabilities of conflict trajectories generated by statistical models. Conflict history turns out to be one of the predictors for future conflict. In other words, peace is more probable to follow a peaceful rather than a violent period. By modeling the random development of conflict and peace, it is possible to make more informed decisions about how power systems can reduce their vulnerability. Those observations led us to develop a framework that acknowledges the multiple effects of conflict and the dynamic nature of conflict uncertainty. Planners can use this framework to analyze if it is best to postpone, diversify, or adjust the levels of their investments, given the likelihood and impacts of possible future conflict. Our hope is that this framework will be part of a new paradigm of “smart” planning models that are aware of their context and will help make power systems more robust to context-specific risks without breaking the bank! As any other research piece, our analysis has several limitations, and we identify needed research. Future research could account for broader and different effects of conflict on the economy, estimate the impact of electrification on the probability of conflict, quantify the conflict effects based on richer datasets, and account for strategic attacks to the infrastructure. Hopefully, this blog post intrigued you so that you’ll want to read the article and join us in addressing these open questions!